First published in 1996, Takeovers Law & Strategy has become well-known as a practical and easy to understand guide to the laws, procedures and strategies relevant to takeover bids in Australia, The 5th Edition updates and expands the work to take account of new techniques and strategies that have emerged since the last edition published. It reflects more than 65 new decisions of the Takeovers Panel, and guidance on such matters as shareholder intention statements. New developments include: Reissuing of ASICâ€™s regulatory guides on takeovers and issued new/revised class orders which modify the effect of Chapter 6 of the Corporations Act; Court decisions relating to: Â funding in the ASIC v Mariner decision; and the powers of the Takeovers Panel; Extensive changes to the foreign investment rules and regulations; Reform of laws regarding media acquisitions; Market experience with the merger authorisation provisions in the competition laws; New market developments, such as: Â development of reverse break fees; contingent value rights as consideration; extensive use of swap contracts to build a stake; and New law reform proposals. 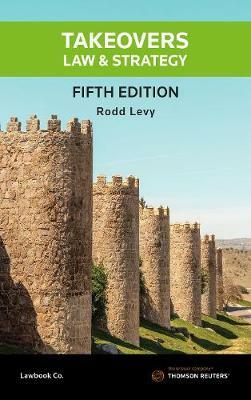 Â Takeovers Law & Strategy 5th Edition is an essential reference for anyone involved in a takeover including lawyers, company executives, investment bankers and stockbrokers, and provides a useful guide for students.